"I found many of the examples to be quite interesting. I find no fault with any of the theoretical portions of the text. The authors are quite thorough in their discussion of the theory underlying each of the topics...This text uses MATLAB for programming the numerical codes. 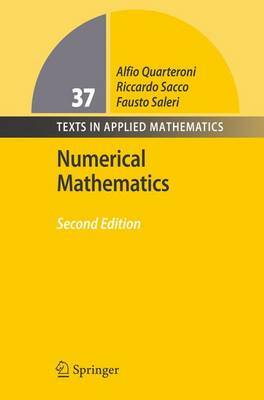 This is a very good choice...It contains a lot of interesting and useful information for experienced users of numerical methods..."
"This is an excellent and modern textbook in numerical mathematics! It is primarily addressed to undergraduate students in mathematics, physics, computer science and engineering. But you will need a weekly 4 hour lecture for 3 terms lecture to teach all topics treated in this book! Well known methods as well as very new algorithms are given. The methods and their performances are demonstrated by illustrative examples and computer examples. Exercises shall help the reader to understand the theory and to apply it. MATLAB-software satisfies the need of user-friendliness. he spread of numerical software presents an enrichment for the scientific community. However, the user has to make the correct choice of the method which best suits at hand. As a matter of fact, no black-box methods or algorithms exist that can effectively and accurately solve all kinds of problems.' All MATLAB-programs are available by internet. ... There are a lot of numerical examples and impressing figures and very useful applications, as for instance: Regularization of a triangular grid, analysis of an electric network and of a nonlinear electrical circuit, finite difference analysis of beam bending, analysis of the buckling of a beam, free dynamic vibration of a bridge, analysis of the state equation for a real gas, solution of a nonlinear system arising from semiconductor device simulation, finite element analysis of a clamped beam, geometric reconstruction based on computer tomographies, computation of the wind action on a sailboat mast, numerical solution of blackbody radiation, compliance of arterial walls, lubrication of a slider, heat conduction in a bar, a hyperbolic model for blood flow interaction with arterial walls. It is a joy to read the book, it is carefully written and well printed. ..... In the reviewers opinion, the presented book is the best textbook in numerical mathematics edited in the last ten years."